Published on November 5, 2013 in Elections, General T&T, ILP, Media, Opposition Party, People's Partnership, PNM, Politics and UNC. 8 Comments Tags: Keith Rowley, Newsday, Politics, T&T Govt, Terrence Deyalsingh. 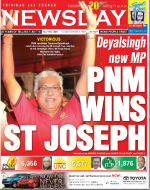 THE PEOPLE’s National Movement (PNM) candidate Terrence Deyalsingh was last night declared the winner of the St Joseph bye-election, but only after the country was taken to a nail- biting finish for what was expected to be the last election in a historic year. Deyalsingh’s nearest rival was the United National Congress (UNC)’s Ian Alleyne who, at some points in the night, appeared in the lead. The Independent Liberal Party (ILP)’s Om Lalla managed the third largest share of votes but was not really in the contest. Neither was the Democratic National Assembly’s (DNA) Michael Lopez and independent candidate Errol Fabien. Preliminary figures released by the Elections and Boundaries Commission last night in a press release indicated the PNM won 6,356 votes (about 45 per cent), the UNC 5,577 (39 percent) and the ILP 1,976 (14 percent). Though Lalla looked set to keep his deposit, the figures suggested the ILP’s presence in the election race had more of an impact in terms of the splitting of votes. “TO THE VICTOR GOES THE SPOILS.”……Congratulations!! After losing to the PNM’s Terrence Deyalsingh by a margin of 779 votes, Alleyne said he intended to use his Crime Watch programme to continue to “mash up” his political opponents. In spite of the almost total and relentless condemnation of the PP by the Media, the PNM and numerous bloggers, the PNM could only muster 45% of the vote. The UNC and the ILP pulled 54% of the votes cast. One must also remember that this marginal constituency has a greater historical association with the PNM. Although the vote was split to a lesser extent than Chaguanas West ,the PNM victory could be attributed to Jack Warner. Also, historically when other frustrated voters stay at home on election day or support third party alternatives, PNM supporters are loyal and consistently practice their “PNM till ah dead” ethnic and tribal mantra. The PM would be very respected for denying any affiliation with Jack Warner again, even if it means losing the general election in 2015.The country cannot risk its international reputation by including Jack Warner in government. PNM party please step back and look at your body of MP’s, select a cross section of representatives to encorporate every ethnic person in T&T. YOu have already started this process by electing a Syrian Mayor and your new face in St. Joseph. Break the racial barrier of people from African and Indian decent and please bring back a more balanced harmonious T&T. Rubbish TMan. Your analysis as usual, comes straight out of your ethnic protective disposition. Tribal and racial predispositions were brought into the Caribbean by those who hailed from Europe and India. Africans were enslaved and became the targets for the tribal supremacist prejudice from these two origins. One began to loose its influence with emancipation, while the other sought to fill the vacuum that was being created. I for one will never allow the spawn of these attitudes to pawn their inherited traits off on Africans. We do not judge people based on what part of the God’s body they are thought to be created from, and do not go around threatening to kill our sons or daughters if they dared enter into relationships with “them inferior people”. The fact that most of the other Caribbean Islands are absent the kind of rancor that inundate the politics of T&T and Guyana is instructive. That rancor is a product of people who have to interact with the majority Caribbean African populations as though they are of a lower caste in order to self project themselves into higher caste. Our refusal to accept this designation has resulted in the rancor that is pervasive in the politics of Guyana and T&T. So when you see the Brahmin aspirants like T-Man waxing deceitfully about PNM tribal supporters understand this represent the pot calling the kettle African American. Because for someone who has inherited the genes from a social system that stratify people based on color and hair texture to accuse those who have traditionally been the victims of such stratification of being tribal, has to be the ultimate in hypocrisy. But then again, that is his modus operandi. John, the PNM has always embraced people of every ethnic group in Trinidad & Tobago. It is actually the reverse, people of certain ethnicity will not align with the PNM to be led by “an inferior race.” The PNM cannot select one as an MP if one is not in the party. As I mentioned before, sari-wearing Trinbagonians do not mount the PNM stage, but dashiki-wearing folks are front and center on the stages of the other parties. Use your eyes and your brains and ignore the propaganda. “the PNM has always embraced people of every ethnic group”..This is a true statement;which supports my previous suggestion “that T&T elect a Prime Minister of Caucasian descent” This does not imply any ethnic or racial overtones.To those who were either in their mother’s womb; or were yet to be conceived ;research the initial origin of the Peoples National Movement,circa 1956. What was the ethnicity of T&T first Governor General? Who (back in the day)was most “likely” to replace the Rt.Hon.Dr Eric Williams as Prime Minister should he resign from office? The answer: either Dr.Winston Mahabhir (God rest his soul)or “Kamal” two of his “most” trusted lieutenants. Effective politics is the winning of ideas, however the machinery that is presented for public consumption is ‘winning’ (at any cost), governance becomes a by-product of winning as opposed to presenting ideas to the population at large and the majority of people putting their faith in those ideas articulated by the winning party. The people on the other hand are almost swayed by the press. In the last general election, it can be easily agreed that Mr. Manning’s behavior was the catalyst for ‘change’, in making their decision, the population had no idea what kind of change they really wanted. All they knew was that they wanted to get rid of Manning and their votes proved that. Either the media’s failure to enunciate the ‘change’ that the people voted for in 2010 was the problem or the people wanted ‘change’ at any cost, as long as it is not Manning. The result of that kind of voting shows that the ‘change’ that was effected was not beneficial to all the people, but a segmented portion of the people whose allegiance was not necessarily for the nation but to those who felt vindicated by the fall of Manning. In almost all polling of our national and international standing we have fallen since then. Our infrastructure is in accelerated decline, the politics is going in the direction of the latrine and Trinidad is hardly a country that can be defined in one word based on our culture, beliefs, lifestyle, systems of governance or wishes for a better future. We are definitely more confused today than we were in 2010. Then, we knew that Manning thought that he was emperor, but the infrastructure remained intact. Today, we have a lady who thinks she is a queen. The video of her ‘celebrating’ her ‘victory’ at the polls on election night (local) is very troubling for someone who is responsible for holding the chains of government, equally troubling is the cast of those who forms her cabinet, cabal or those responsible for carrying out the dictates of her desires. Here is a drunk PM, calling portions of her country ‘home’ and negating the other parts she did not consider ‘home’. No matter how you look at the future, it is in trouble. The people must be sincere in their desire for good governance and let their intention known via the ballot box in order to elect a government of all the people in the next election. As far as the media is concerned, it is probably just as troubling or more troubling in terms of how they cover ‘news’ and politics. In figuring out what our media is conveying to us we need to ask questions like: who owns the media house?, how is it’s executive board constructed?, who forms the executive?, what vision they have for T&T?, what are their motivations for staffing?, what is it’s political affiliation? etc, etc etc. They are the sources from which we draw our knowledge of what is happening in the country, so how it is presented to us is very important. As presently operated, our media is not much better than publications such as the ‘Enquirer’. We need informed journalists and journalists who have ‘the eyes of a tiger’ to investigate and break news of importance that affect all of us not sensational nonsense and mauves langue. We need a good fourth estate in order to be truly informed. When we are well informed it makes our choices easier in terms of who and what we put in office.